A mental model reflects an individual's beliefs, values, and assumptions. As those are quite often internal, we need to somehow express them in order to learn and improve. In fact, the model with Causal Loop Diagram is a representation of the mental model. We could explore different mental models by simply doing advocacy and inquiry with CLD. Balancing advocacy and inquiry is one key practice for the discipline of mental models, among the five disciplines from the classical "The fifth discipline" book. This article shares with you an example. It came from my CLP, and we were doing system modeling for #backlogs and its impact on the adaptiveness. The above picture provides the setting. 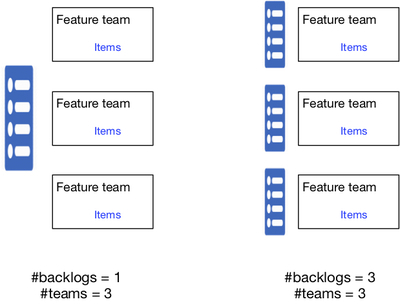 Suppose that we have 3 feature teams for one product, we could have 1 backlog and let 3 teams share one backlog (the left in the picture); or we could have 3 backlogs and let 3 teams have their own backlogs (the right in the picture). The adaptiveness means team's capability of changing to do other higher-value work. It is affected by both the motivation and the ability to adapt. We came up with the below CLD representing one mental model. There were three causal paths indicating the relations between #backlogs and the adaptiveness. One student shared that in her organization, they had more backlogs (i.e. the case of 3 teams and 3 backlogs), but it seemed not leading to lower adaptiveness. What happened? We then reasoned about each path and explored other possible mental models, by doing both advocacy and inquiry. [me] did more backlogs lead to lower transparency? [student] what is transparency here, could you elaborate more? [me] transparency here means the chance of knowing the value of their work relative to the whole product by the team. 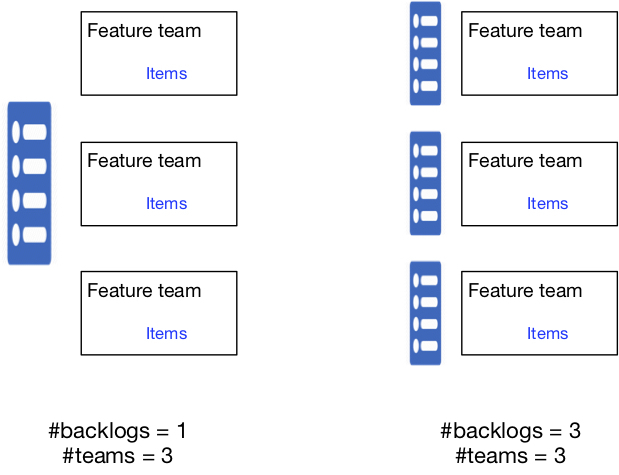 when each team has their own backlog, teams may not know that they are doing globally lower-value work. does this happen in your organization? [student] not really. we have pretty fast feedback for our work, if one team does lower-value work, the business impact would be lower, which would be visible for them quite soon. [me] interesting, so, then, the motivation to adapt stays high? [student] yes. we are always motivated to adapt for higher-value work. [me] how about local identity? having own backlog limits the work scope for the team, thus team develops stronger local identity, which demotivates them to work on any other work outside their scope. do you see this in your organization? [student] not really. it is the norm in our organization that if the business impact is low, we gotta change. our team never sticks with the local identity. i guess, this is because we are always driven for business success. [me] how about the ability to adapt? as each team gets specialized in their work scope, their knowledge breadth gets small thus decreases the ability to adapt. do you see this in your organization? [student] indeed, the adaptation is always painful for the team. they are motivated to adapt, but they don't prepare for it in terms of knowledge. we have been struggling with this. [me] yes, in LeSS, there is only one backlog and multi-team PBR is specially designed to maximize broad learning optimizing for the adaptiveness. We updated the original CLD, reflecting the different mental models that we explored. For their organization, strong orientation to business feedback increases the motivation to adapt, while the limited broad learning due to specialization decreases the ability to adapt. One challenge in working with mental model is that it is often implicit. CLD helps express it, and doing both advocacy and inquiry on the causal links is a powerful way to explore different mental models. This page contains a single entry by Lv Yi published on February 4, 2019 10:58 AM. #backlogs - the ultimate lever was the previous entry in this blog. The trap in learning from success is the next entry in this blog.